Outdoor play structures are like a blank canvas allowing children the opportunity to be inspired, embrace development, imagination and creativity through play. Deer Creek offers the ideal blend of inclusive play events that assist in improving gross motor skills, sharing, muscular strength, socialization and coordination. Between the upper and lower deck, Deer Creek is designed with 7 play components combining walking, climbing, sliding and rhythmic activities. 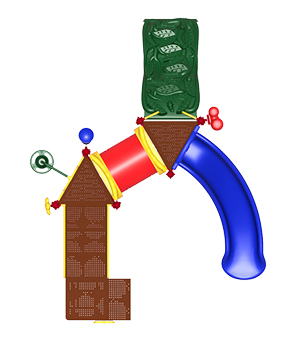 This strong playground challenges each child differently with the various apparatuses, each providing access to the Crawl Tunnel and Curve Slide. The ground level deck features a Rainwheel, Bass and Bongo Drums, which exposes children to beats and sounds of their individuality. 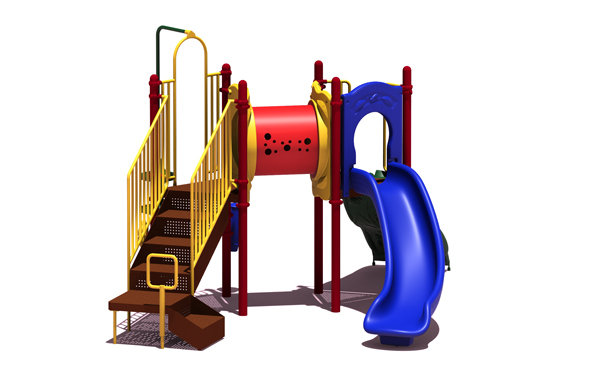 Multi-functional, compact and ADA compliant, the Deer Creek Playground provides enjoyment for children 2 to 12 years old. UPLAY-002-P - 27'8" x 32'10"
UPLAY-002-N - 27'8" x 32'10"
Playground structures enhance the community aesthetic and are a key component in enriching the overall child development. Deer Creek is constructed with durable and safe powder-coated metal posts and heavy-duty roto and blow molded plastic components.